So Puma brand made some noise in 2016 with their new generation sneakers that showed Puma‘s comeback into the main sneaker game. But this time they killed it COMPLETELY. 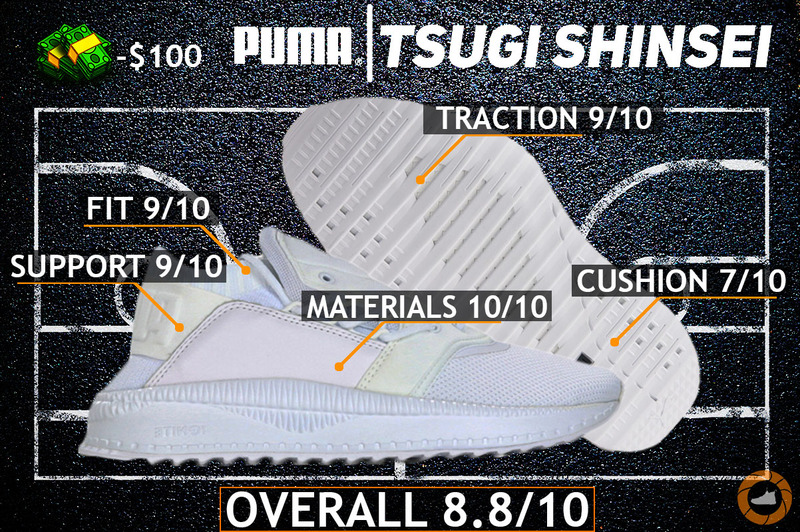 Welcome to the Puma Tsugi Shinsei Performance Review & Score card. 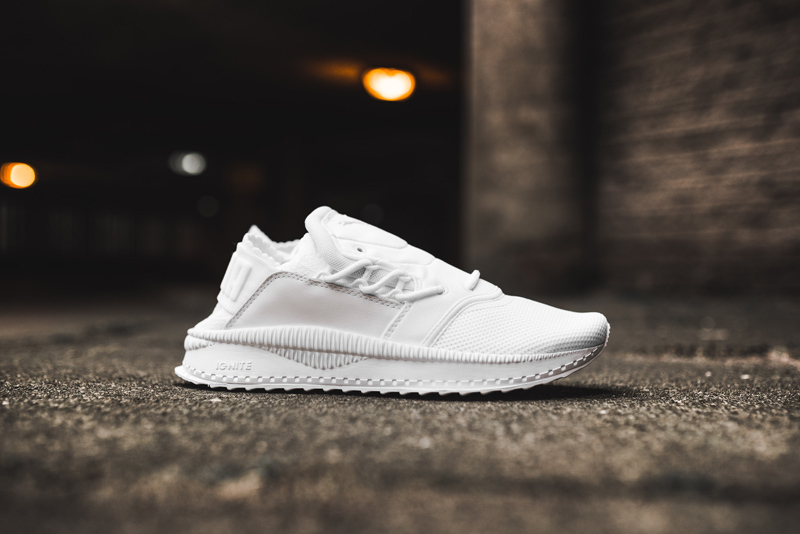 So Puma brand really surprised me with the materials they used on the Tsugi Shinsei model – Mesh, EvoKnit (like primeknit or flyknit) and synthetic leather. Wait a minute… For $100? That’s crazy value for 100 bucks. Any other brand can’t offer this kind of upper for this money. This is a very smart move by Puma to offer more for less and make a significant price difference between closest competitors. Starting from the toe box, there’s super soft Mesh which is well known for its great breathability and knit like fit. It covers your forefoot pretty nicely and almost feels like Primeknit material – much forgiven, lightweight with zero restrictions for your natural feet movements. Now from the midfoot to the heel area, we have Puma’s EvoKnit, it’s your regular knit like Primeknit from adidas brand. But damn, that EvoKnit caught my attention big time – it’s super soft, stretchy and it does feel like wearing an actual sock. Of course, the midfoot section features that protective shield vamp (like on the Kobe A.D. NXT) for much needed support & more structure. Without this piece of material, you basically are walking with socks, so it does help a lot. 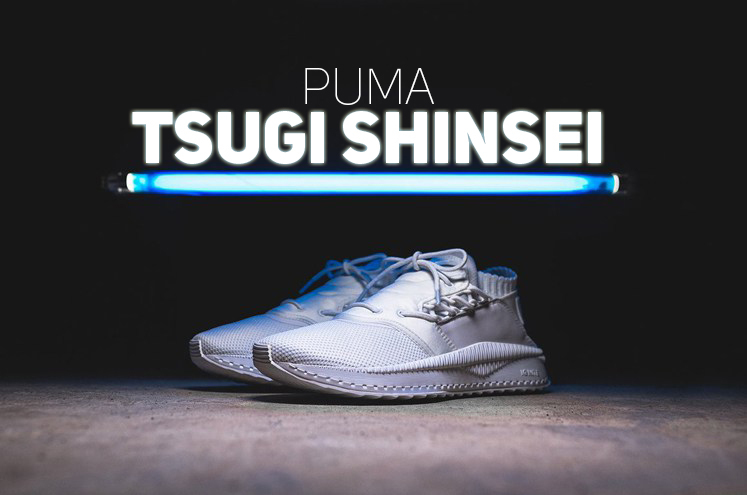 The Tsugi Shinsei features Puma’s IGNITE Foam midsole for more responsive ride & better impact protection. But is this Foam really so responsive tho? Yes and no. 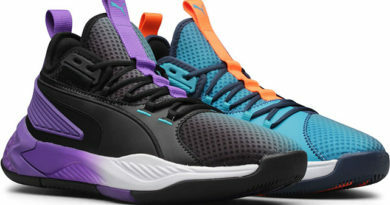 Now, comparing with what other bands are offer in this category, the Puma has no chance to even be a decent contender (compairing with BOOST or Air Max cushion setups). On the other hand, they pretty much one of the best options at this price range, so it’s pretty good. The midsole does offer respective amount of softness and impact protection, especially in the heel area. After spending a whole day in them, I didn’t receive any knee or heel pain and that’s what you want from cushioning for lifestyle. As always, I will be short with this one because it’s a casual sneaker, so traction is intended for performance. The Razor-edged style rubber outsole gets the job done as you expect – no more, no less. You will be good on any type of surfaces. Also, you can see the Foam midsole peeking out of the outsole. It does not affect the overall performance, but it looks awesome to actually see how the Foam is looking like. Lastly, the rubber compound feels quite durable, so they’re gonna last quite a bit of time for you. We have a very unusual progressive lacing system intergraded into both sides of the protective vamp. I actually never had a chance to see something similar to that on a lifestyle sneaker. It’s a very unusual decision to make such as innovating lacing system, but man, they do now how to do it properly. Due to this progressive lacing system & a vamp you have a lot of room for customization to create a perfect fit for your feet. There’s an additional pair of holes on very top of the vamp if you prefer a very tight and snug fit. Besides that, EvoKnit and Mesh combo works together perfectly to create a breathable, lightweight, soft sock like fit. Love it. 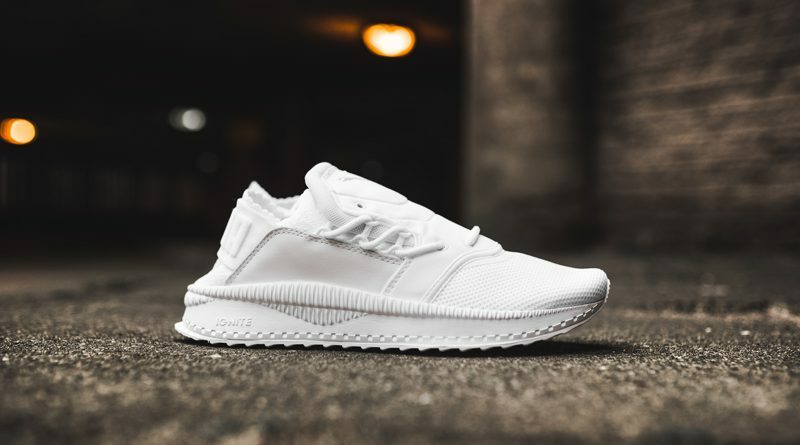 So with those stretchable materials, a customizable fit and quite wide construction, the Puma Tsugi Shinsei will accommodate any type or shape of foot. Wide footers should go whatever their true size is. And regular or narrow footer might want to go ½ size down for better one-to-one fit. We’re not paying attention at the support section as it comes to casual wearing. Still, proper support is much needed thing on every single sneaker and they really shines in this department. The support package isn’t one of the biggest, but existing features work perfectly. We have a pretty wide strap with the puma branding in the heel area for heel lockdown – it nicely adjusts to your heel shape and secures from heel slippage. Now the second one is that protective vamp on top of the EvoKnit which hugs your midfoot from different sides, while securing your whole foot from rolling over the foot bed. Furthermore, these two support pieces are both connected with each other, that’s why the whole shoe construction is solidly supportive. Puma really killed it this time, I’m very impressed with this model and it’s now probably the most favorite Puma’s sneaker of all time. You just can’t deny them. So if you’re looking for a new pair of sneaker for summer or spring season, then these should be on your buy list, no doubt. 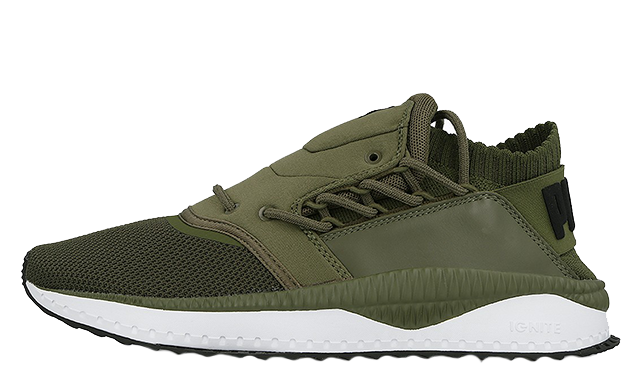 What makes the Puma Tsugi Shinsei an altime buck for your bank deal? It’s simple, solid performance in each department – premium materials, that awesome sock like fit, comfy midsole, lightweight construction, strong lockdown, the list is going. Finally, ESTHETICS. You will turn everybody’s heads with this fire on your feet, that’s for sure. Hope you enjoyed my Performance Review on the PUMA TSUGI SHINSEI. Did you cop them already? Super glad to hear you enjoyed it! They’re definitely not for everyone’s taste and style. But if you can pull them on, then this is a must have pair for you, my friend. Great review. Lots of detail and really well written. I like this shoe as well. I think I will be adding it to my collection if I can find it in my size. Do you have any shoe reviews for people with larger feet around the 16, 17 size? I barely find people who review shoes for those sizes. Unfortunately, I can’t find your size anywhere. The biggest size I was able to find was 14. Probably they don’t run this big. It really sad that brands are not paying attention to people with larger feet, it’s super hard to find a decent pair of trending sneakers. I actually do have the Nike Vapormax review and I saw a size 15 on Finish Line. They feature Flyknit material, so maybe they would fit you properly. You gave me a good idea. I’m going to make a list of sneakers for people with larger feet very soon. It provides really good value and it is just what I need. I want to feel my shoes less and I really liked that it felt like a sock so I can wear it without any discomfort. I really needed something like this shoe in these hot summer days. 100% agree with you. This shoe is a must cop for this summer. This is an awesome looking shoe. It really looks comfortable. Wow has shoes come a long way since my basketball days in Chuck Taylor canvas high tops. We would have said this shoe looks like some sort of space ship back then. $100.00 isn’t a bad price considering what they charge for them now. Yeah… We definitely came a long way. New technologies, new silhouettes, it’s crazy. But I like it tho. Which is the best basketball shoe for a very fast, defensive point guard? The Kyrie 4’s or Curry 5’s if you prefer sitting very low with minimal amount of cushion. Or go with the Harden Vol.2’s or CrazyLight 18’s for more impact protection.